The Wilmington Blue Rocks proudly announce that the 2009 season saw the team, in tandem with its marketing partners and fans, donate and raise $424,000 worth of contributions to local charities, schools and community organizations. The sum represents a collective of many different types of contributions with the majority coming from monetary and ticket donations. Blue Rocks concessionaire, Centerplate, allows community organizations the opportunity to volunteer at the concession stands during home games in return for a percentage of the money received at each stand. Thanks to this program almost $74,000 was given back to community organizations. The Blue Rocks continue to support local youth baseball and donated over $1,600 as well as used baseball equipment to local Little League organizations. Game-w orn memorabilia auctions saw an increase in frequency and dollar amounts, helping to raise over $6,300. On April 19, the Blue Rocks wore purple hats to raise money for the Bernadette Farrell Memorial Fund as part of Domestic Violence Awareness Night. The Rocks sported pink jerseys on May 29 to benefit the Delaware Breast Cancer Coalition. The Rocks wore camouflage hats on May 30 and August 1 to raise money for Delaware Boots on the Ground and USO Delaware. On July 3, Wilmington donned patriotic jerseys to support United Cerebral Palsy of Delaware (UCP). The Rocks wore Red hats on June 25 to raise funds for the American Red Cross of the Delmarva Peninsula. The Rocks also sported gold jerseys on Aug. 13 for Elvis Night to benefit the local chapter of the American Lung Association. Blue Rocks players went beyond the laundry too, donating game-worn cleats and batting gloves that were auctioned off for charity. his Reading Challenge, presented by the Delaware State Education Association. 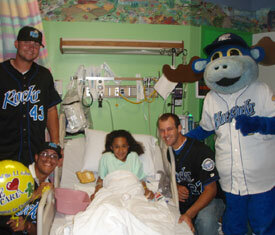 The Blue Rocks worked with local schools to reward kids who met their reading goal. 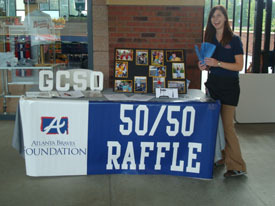 In 2009, over 150 area schools were awarded a total of 57,000 tickets. Along with Rocky’s Reading Challenge the Blue Rocks donated over 2,500 tickets through programs like the IFS Outstanding Students Program, which allows teachers to reward students who display excellence in behavior and performance in the classroom. The team also donated over 8,000 tickets to community organizations throughout the 2009 campaign with 6,000 going to local fundraisers, 1,000 donated to the USO Delaware to use for their soldiers and staff, and the remainder finding a number of other local non-profit organizations in need. Those same non-profit groups received another $2,000 worth of free/discounted video board advertising and concourse tables to promote themselves and their worthy events. The Blue Rocks organized special events to collect money and goods for those less fortunate. Before the season, the team held a gift drive for kids at the Mary Campbell Center. The team also offered ticket discounts to fans that donated items to the Food Bank of Delaware. The Blue Rocks Charity Golf Classic, held at Deerfield Golf and Tennis Club on Aug. 17, raised over $1,500 for UCP and CHILD, Inc. in one day. Community appearances proved a regular item on the team’s calendar. Mascot Rocky Bluewinkle and numerous Blue Rocks players visited A.I. duPont Hospital for Children at least once a month throughout the season in addition to other appearances. Rocky logged over 60 community service hours at schools and charitable events as well. Rocks’ players put in over 20 hours despite their grueling 140-game schedule over five-plus months time. The Blue Rocks visited schools and community organizations throughout the Delaware Valley, tallying over 40 hours of their time throughout the season. The K’s for Kids Program presented by Blue Cross Blue Shield of Delaware (BCBSDE) completed its fourth season with great success. BCBSDE donated $10 to a local charity for every home game strikeout the Blue Rocks pitching staff recorded. Thanks to this program, BCBSDE presented Girls on the Run a check for $5,000 before the Blue Rocks game on Sept. 2. Challenger Little League returned for its annual day of baseball on May 12. Teams from the league were able to play their games on Judy Johnson Field before the Rocks’ contest later that night in a tradition that has spanned over a decade. During the last homestand of the regular season, the Wilmington police department collected donations for the daughter of a slain Georgetown police officer Chad Spicer. The generosity of Blue Rocks fans contributed over $5,000 to Aubrey Spicer’s trust fund. The Omaha Royals increased their giving to local charities, community organizations and schools during the team’s 2009 season. The Royals, with the help of several of the team’s advertisers and its fans, donated more than $861,000 this season, mostly in the form of tickets and cash. That figure was up almost $40,000 from 2008. Two season-long promotions generated over $11,000 in cash for two charities. The “Hurl the Pearl” promotion, presented by Nissan of Omaha and McDonald’s, raised almost $8,200 for the Ronald McDonald House. Werner Enterprises donated $2,870 to PlaySmart through its RBI promotion, in which the Royals’ 2009 presenting sponsor pledged $10 for each Royals RBI at home. Once again in 2009, the Royals held silent auctions of various specially-designed jerseys and caps – autographed by the players who wore them – during several home games. On June 6, an auction of baby blue jerseys and caps raised $2,155 for the Nebraska Colon Cancer Screening Program. The Royals wore red caps on June 27, w ith that auction and a $1 donation for every red item sold at the Royal Treasures Gift Shop netting $1,114 for the ALS Association. The fourth annual Strike Out Breast Cancer Night on August 7 featured an auction of pink jerseys and the sale of pink hats, providing $3,479 for Susan G. Komen for the Cure. An auction of Royals black hats on August 28 raised almost $1,000 for the Make-A-Wish Foundation, while a September 3 auction of baseball memorabilia generated over $1,400 toward the team’s $11,000 goal to support the AllPlay Foundation in 2010. In 2009 the Royals donated thousands of tickets to their home games, with most of them being earned by school children through good work in the classroom. Almost 24,000 students from 74 area schools were encouraged to read books in exchange for tickets to Royals games in the Hit the Books program, which was presented by the Nebraska College Savings Program. Nearly 11,000 students from 70 area schools received tickets to the team’s April 20 game for the 10th annual Cox Communications Home Run for Youth Day. The Royals donated 25,000 Reserved Seat tickets for their August 8 game to the Omaha Public Library’s Summer Reading Program. 10,000 General Admission tickets went to the United Way for that organization to use as a “thank you” gift for their donors. Also, businesses and season ticket holders donated over 2,800 Royals tickets to Baseball Buddies, with those tickets going to kids who normally wouldn’t be able to attend a game. The team’s Community Organization of the Night program continued to grow in 2009. Partnering with Thrivent Financial for Lutherans, the Royals provided over $53,000 worth of advertising, booth space and tickets to 72 non-profit groups and gave them a forum on-field and on the team’s game broadcasts to talk about those organizations’ work in the community. Royals fans brought more than 2,200 cans and boxes of Our Family Brand food to Sunday home games, with all of it going to the Open Door Mission. In exchange, those fans received more than $15,000 worth of tickets. The Royals staff, players and mascots were also busy away from the ballpark, with the staff giving more than 400 hours and the players and mascots chipping in over 200 hours to community service and appearances. On June 11 alone, Royals staff members committed more than 50 hours of community service, in honor of the team reaching the 11-million fan milestone earlier in the season. On August 22, a dozen staff members, family, partners from Lovgren Marketing Group and Casey took part in an ALS Walk at Elmwood Park, raising $4,500 in pledges. The team held its annual golf tournament on August 31 at Pacific Springs, raising more than $2,500 for the Muscular Dystrophy Association in honor of Royals manager Mike Jirschele’s family.